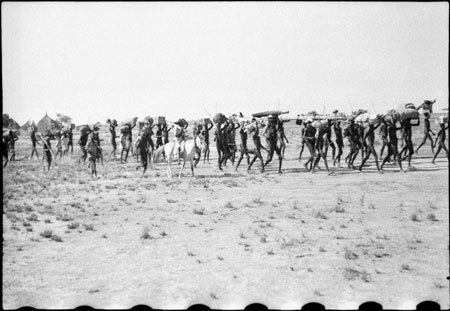 A group of Thesiger's porters walking with baggage on heads, and possibly Idris Daud on horseback. On his first four month trek in Western Nuerland Thesiger employed about thirty porters at a shilling a day, who each carried about forty pounds in weight. Thesiger conceded that many of the porters were necessary simply to carry food for the others. Morton, Chris. "Nuer porters on trek" Southern Sudan Project (in development). 03 Jan. 2006. Pitt Rivers Museum. <http://southernsudan.prm.ox.ac.uk/details/2004.130.36570.1/>.